I did not grow up showing much, just a little during a couple summers on a friend’s horses that she wasn’t riding. You could never paint us with any discipline brush because we entered as many classes as we could English or Western, including any sort of Gymkhana classes. Then a little showing again in college on the equestrian team. I don’t remember any great successes, but I really enjoy the process of showing, similar to the way I enjoy horses. I love every part of horses. Hauling hay, cleaning stalls, their smell, the way they move and talk to each other, grooming, caring and riding them, just being a part of their world. With showing, I love the show preparation of packing, laundering pads and show clothes, cleaning tack, bathing the horses, getting up super early and spending the entire day/s immersed in horse. 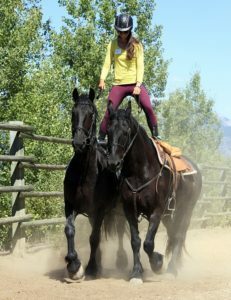 Looking back on the last seven years that I have been showing, I have learned many lessons about myself and my horses. My horses seem to enjoy getting out and they are different at a show. More engaged. Sometimes the engagement comes out in underlying tension and nerves. You learn your horses. They may need less time to warm up or more time. They may need time to just walk around and let it all soak in. Shows are a great way to bond with your horse and rely on each other. They learn to be around lots of other horses, cars, people, signs, loudspeakers. They see new arenas, new scenery, new obstacles. Although, I learn the most about me. Being the “doer of deeds” and at most shows my face is definitely “marred by dust, sweat and blood”. There were times I did it for the color of the ribbon. But just wait, partnering with a large animal with their own brain will fix your ego. Then there is the liability of my brain. Doing the wrong pattern, forgetting the rules, going off course, “because there is not effort without error and shortcoming.” I don’t take much for granted anymore. The most important lesson I have learned is that it is never the horse’s fault. I want to be “all in” for my horses. It is really all about them and they are without question a “worthy cause”. We, horses and people, were created to partner and be a team. We work with them to do what they were made to do, but in a certain sequence. We add value to who they are in their life with people by exposing them to new environments and by partnering with them to reach their potential as well as ours. Now I show partly because it gives me goals and a reason to, “actually strive to do the deeds.” Life is busy and I have to have something I have invested in coming on the calendar to make me get out, ride and improve myself. I owe it to the horses to continue to better myself through time riding, lessons and by showing to get evaluated on my progress and goals. I want to ride at the best of my ability in order to show my horse to the best of their ability. You will rarely be ready or prepared, but go anyway. Show day is not a day to fix anything, don’t worry about the judge/s, do your best in that moment. It’s is just a horse show, whatever happens, happens, I guarantee you will both learn, grow and many times surprise yourself. Most importantly, HAVE FUN and make it a great experience for your horse. “Competition does not have to be a horse show or a race against another horse. Competition can be a set of standards by which we measure ourselves. Your standards have great influence on your perceived results. Choose them carefully. It is not about the blue ribbon. It is about evaluating the direction of our work and establishing deadlines for reaching goals… I will always compete, as I need to be challenged and held to an honest evaluation of my progress. 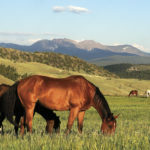 I don’t have to win the blue ribbon, but I need to know if I’m as good as I think I am.” Trainers Aaron Ralston in “Ride Up: Live your adventure.” Co-written with Edgall Franklin Pyles. Set goals, challenge, push and stretch yourself. Get out of your comfort zone. Don’t just do what’s necessary, do what’s possible. Be relentless, because it is not how you start something, but how you continue. Expect to fail. Success does not come without failure. Then accept your failures. After all, we connect with each other through our flaws. The ultimate measure of a man is not where he stands in moments of comfort and convenience, but where he stands at times of challenge and controversy. 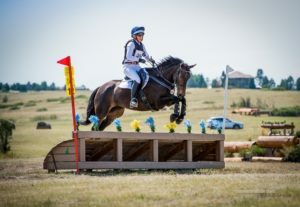 Martin Luther King Jr.
As we reach the end of the summer show season, I encourage riders to set some goals for next year, to find a couple shows or trail rides or team events to participate in. If participating seems too intimidating at first, start by volunteering and see what it’s like. 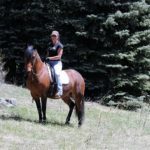 There is a kind of horse sport, competition or group for everyone with any shape or size of horse that you will enjoy and meet new horse people along the way. Encourage each other and the strangers you will meet along the way who will become your friends. You will see new places and know victories “and who at the worst, if he fails, at least fails while daring greatly”. Feel free to contact me if I can be of any assistance in helping you find a challenge or to share your horse story. [email protected] Heather McWilliams © 2018. In my life so far, I have ridden in 8 different countries and I feel so honored and privileged to call THIS equine community my home. The people here truly care about their horses and about each other. For each of you this support means something different. But for me, it has allowed me to grow and learn as a horse person and is one of the reasons I have been able to start this ambitious project. I have been riding since before I can remember. In a note about my first ride, my mom explained that I wanted to ride all by myself with no help. “I love Casper,” I proclaimed as I hugged him. No one in my family was into horses and they had absolutely no idea what they were getting into when they let their little girl exchange house chores for riding lessons. When I was 5 we noticed several trucks, horse trailers and horses at our local community center. We went up to a man in a cowboy hat and my parents explained my obsession. Luckily for me, Ralph understood my obsession and happened to be afflicted in the same way. The Brush Bustin Trail Riders were a group of cowboys on an annual three day trail ride. They rode about 30 miles each day, camped, and ended up at the PRCA rodeo in Spooner, WI. My parents invited the entire group to camp at our place the following year. We became good friends with Ralph. Not long after we first met, he had my dad putting up fencing on our property and brought a couple of horses over for us to take care of. One of the mares that he brought was bred, and so began a six-year-old’s first full life course on animal husbandry. It was an experience complete with sleeping in the barn and hourly checks when the due date arrived. I got to be there for the birth. A few days later, the Cowboy Ralph came over to check on the new foal. He asked me if I wanted the little colt to be my first horse. My acceptance was enthusiastic, to say the least. Ralph is 86 years old now. He still rides, drives and farms his land where he keeps 16 horses, two mules, a miniature donkey and lots of sheep. * Driving, pack trips, breed shows, and Performances at Road to The Horse in Kentucky with the Norwegian Fjords. * Owning a Little Iron Horse, also known as the Cheval Canadian. * Riding to my wedding on my Kiger Mustang. * Crossing Country borders from Slovenia to Italy on the Lipizzaner. * Working with the Skyrian Pony at a Therapeutic Riding Center in Greece. * Thanks to local Helen Mleynek, falling in love with an incredible gaited breed – The Icelandic. My equine love story probably feels familiar to many and it has led me down a unique and exciting path. In September of 2017 I officially launched my DiscoverTheHorse Quest. I am going to ride and document every breed of horse in the world. There are over 350 breeds. When complete, it is my hope for this to be the largest equine education project of its kind. With no actual road map, doing something that has never been done before, my goal is to make meaningful and entertaining content. So I decided to document with video. 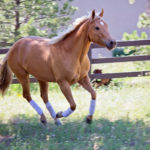 Ideally, each breed will have videos featuring something the breed is known for, an impressive example of the breed or a ride in the breed’s country of origin. For each breed, I put together a quest video and an “about the breed” video. The quest video takes you on the journey with me and tells the story of my ride. The breed video goes into more detail about the breed features and history. All of the videos can be seen on my Facebook page, Youtube, and my DiscoverTheHorse website. Since the project launch, I have ridden and documented 26 breeds. My videos have accumulated over one million views on Facebook. The Irish Draught breed video is the most popular so far with over 250,000 views and counting. Feel free to join 7,500+ followers on the DiscoverTheHorse Facebook page to come along for the rides. My most recent quest tour brought me east. Meeting the horse that played “Hidalgo” in the movie with Viggo Mortensen and going on a ride with an Emmy award winning TV producer were a couple of the highlights. I am very excited about the future. After planning and thinking about this idea for over a decade, it truly is a dream come true to be doing this. Horses are my passion. Meeting these people and horses all over the world shows that we have a common bond that bring us together in a truly authentic way. If through doing this I can bring awareness to our amazing animals, I know it is what I’m meant to do. This brings me to you. You have your own story. All of us have one life to live and yet often times we limit ourselves. There are fears, finances and time. What will people think? In the horse world we often get into debates about training styles, disciplines and philosophies. These concerns and opinions are valid and they are real, but you would be amazed at what you can do if you decide its okay for people to call you crazy. The first one is easy. Go and hug your horse. Thank them for the role they play in your life. If you don’t have a horse right now, a dog, cat or human are reasonable alternatives. Please don’t hug the elk! Second, I challenge you to come up with something that you have always wanted to do. It doesn’t have to be a big thing, just something that is meaningful to you. Take the steps you need to make it happen. And remember to use your amazing horse community that you have right here to help you succeed. Bob is Back in the Saddle! 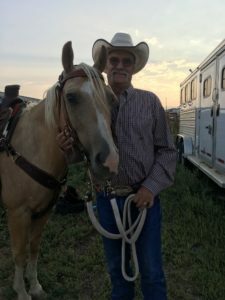 From Colorado Serenity Magazine, November 2017: On August 17, 2017, Bob Benefiel was bucked off his horse. Immediately after the fall, Bob was unconscious and not breathing, he then started breathing on his own. 911 was called and his wife Jody held his cervical spine until EMS arrived. He was taken by ambulance to Elk Creek Elementary School where he was met by the AirLife helicopter and flown to St Anthony Hospital. It was determined that he had suffered a severe spinal cord injury that was caused by a herniated disc at C2 & C3 that was compressing his spinal column. He also had 2 additional cervical vertebrae that had stable fractures. He underwent emergency surgery that same night and was then admitted to the Neuro Trauma ICU at St. Anthony Hospital. On August 24, Bob was transferred to Craig Hospital with a central cord injury with permanent damage to his spinal column at the level of C3 & C4. He is considered to have incomplete paralysis. At the time of admission to Craig Hospital he just had movement of his big toes and thumbs. At Craig Hospital, Bob had an intense rehabilitation schedule from 8am-4pm daily. He did not stop there. Anytime he had a space in his schedule, he found an opening in the therapy schedule to fill it in. In each part of his therapy appointments he pushed his limits and went beyond what was required that day. Bob told everyone at Craig that HE WOULD WALK OUT OF THERE! With his dedication, grit, determination and of course the attitude that this was the time to COWBOY UP, he made huge strides daily. Any free time outside of therapy, Bob spent talking and encouraging other patients to keep trying. Bob’s focus and optimism throughout his journey has been infectious to all of those around him. His attitude made such an impression on the Craig staff, Bob has been asked to return to give talks about his accident and his recovery. Incredibly, although not surprisingly to his friends, family and staff at Craig Hospital, Bob did just as he said he would and walked out of Craig on November 2nd. After walking out of Craig Hospital that day, Bob set his next goal to getting back in the saddle a year after his accident – it may have been sooner, but he promised his doctors he would wait a year! On August 17th, Bob reached that goal and rode his gelding Dusty and has been riding since! Seeing others ride since the accident has been difficult and brought back memories of being a kid and how much he loved to ride. That drive to ride again kept him going every day. Bob explained that the accident was very humbling. He learned to ask for and receive help. Bob never blamed the accident on the horse. He admitted he knew better and hurried her along without doing the groundwork he knew was so important. “You can’t rush a young horse,” Bob stated. Most importantly, Bob and Jody want to express how grateful they are to all of the people that have supported them on this journey. They are beyond thankful for this community and all of their help, thoughts and prayers! We started with the McWilliams Group by purchasing a ranch from them. We had some rather strict requirements on the property we were looking for, and they found an exact match in only a few days.